Placenames are a vital part of our heritage. They preserve folklore, geography, history and tradition. 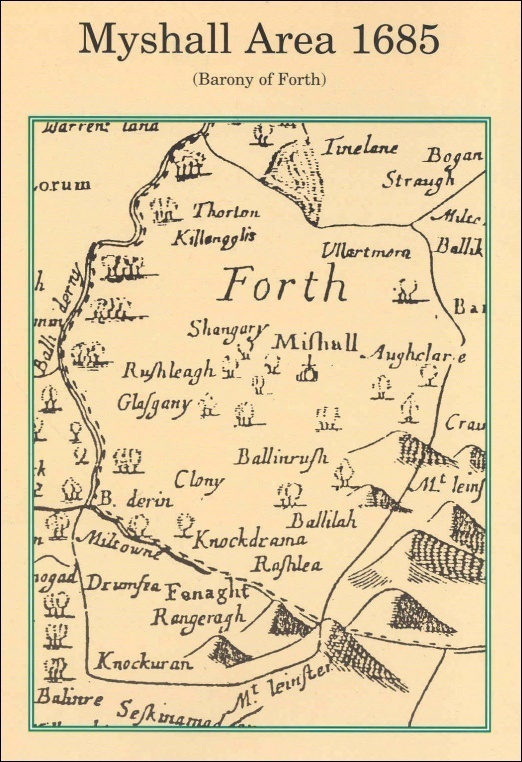 The vast majority of the placenames of our parish are Gaelic in origin and were given to the various localities by our ancestors in the dim and distant past. Each place name had a special meaning and their roots often go deep in history. It is an absorbing and rewarding task to study and explain them and even the name of the smallest patch of ground or boreen or hill or stream is worth preserving and recording not alone for ourselves but for the benefit and enlightenment of generations to come. Some of the words in Gaeilge have become grossly corrupted in the course of time by Anglicisation, by erroneous spelling and by faulty pronunciation while many of them were never written down but passed from mouth to ear down the generations. The old townlands were often divided into quarters which were generally distinguished from one another by adjectives describing size, position, shape or quality of the land or by adding the names of the occupiers (PW Joyce Irish names of Places, Vol. 1 Page 244 published Dublin 1869). 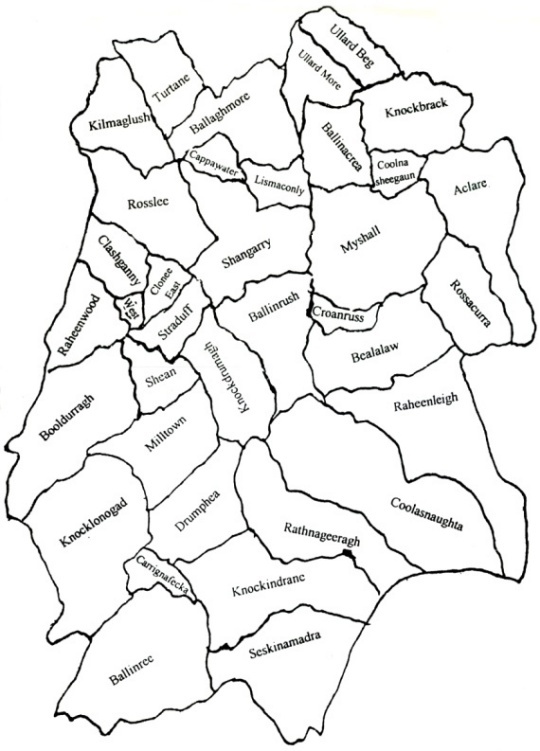 There is evidence of this in our parish where there are 36 townlands in all – 34 distinct townlands with Clonee divided into Clonee East and West while Ullard is divided into Ullard More and Ullard Beg. The reader will also notice from the table below how the occupiers of various portions of land may have given the townsland its name e.g. ‘Cappawater’ – ‘Walton’s plot of land’ or ‘Clonee’ – ‘Hugh’s meadow’. Depending on the date and circumstances in some cases the landowners had sufficient influence with Government officials to have their own names substituted for the ancient ones. Some townlands have been submerged into adjoining townlands and examples of these in our parish are Tinnmogney (House of Mogney) which has been absorbed into Myshall itself and Killeavy (Church of the Mountain View) which is situated in Shangarry though that name is still attached to a field and sometimes the crossroads otherwise known as ‘Doyle’s Cross’. The meanings and Irish translations given in this article are all taken from a book called ‘Place Names of County Carlow’ written by Edward O’Toole 1937. The extra meanings denoted by an asterisk are ones that have been used by locals and have come to the attention of the Magazine committee. Edward O’Toole was from Rathvilly and in the course of historical research he studied ‘Name Books’ which were preserved in the Ordnance Survey Department in the Phoenix Park. This list is not exhaustible and inevitably there has to be a measure of conjecture but everyone interested has a right to be heard. Hopefully this article will lead to discussion and perhaps the recording not only of the townlands but also of the various field names, bridges, gaps, hillocks, streams etc. before they are lost forever. The study of ancient maps also provide a wealth of knowledge on the names of places and how they have changed over the years. Myshall village itself does not exist on the map prepared in the year 1570 for Sir Peter Carew though Drumphea that is now part of the parish is marked spelled ‘Drumffey’. Myshall is clearly marked on the map of Sir William Petty of 1685 as are many other of the townslands as we know them today though the spelling is somewhat corrupt e.g. Turtane is spelled Thorton, Kilmaglush - Killengglis, Clonee - Clony, Bealalaw - Ballilah, Rathnageeragh - Rangeragh, etc. 34 distinct townlands, with Clonee divided into Clonee East and West, while Ullard is divided into Ullard More and Ullard Beg.